All mothers face distinct challenges in raising their children, perhaps none more so than those who are incarcerated. Research indicates children of an incarcerated parent are six times more likely to be involved with the criminal justice system. Recognizing the need for more support for women in detention facilities, Associate Professor of Criminal Justice and Security Kimberly Collica-Cox developed Parenting, Prison, and Pups, an innovative and award-winning program that combines a parenting class with animal-assisted therapy (AAT) to help mitigate stress and reduce recidivism. This first-of-its-kind program is a partnership among Pace, the Metropolitan Correctional Center (a federal detention facility in New York City),the Westchester County Department of Correction (a county jail), and the Good Dog Foundation (a nonprofit that trains and deploys therapy dogs). It is supported by Pace grants and $45,000 in external funding from an anonymous donor.Although data on the results of the program is forthcoming, anecdotal feedback from participants suggest positive outcomes, and Collica-Cox has received numerous accolades for her work. 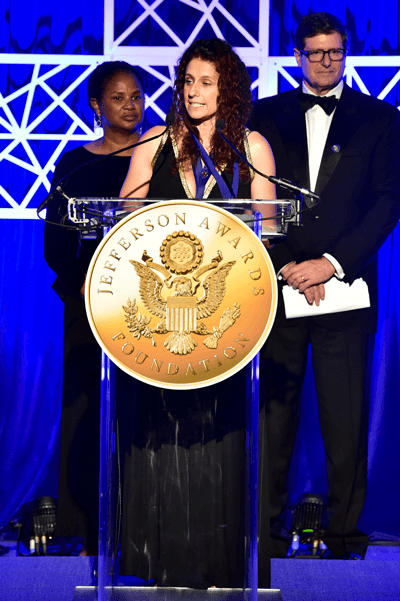 In July 2018 she was honored with the Outstanding Public Service by an Employee Award by the Jefferson Awards Foundation, the nation’s longest-standing organization dedicated to inspiring and celebrating public service. The Parenting, Prison, and Pups (PPP) program was originally profiled in Spring 2018. Visit the Dyson College website to view the article.